UNCHARTED 5!! Wait can we call it Uncharted 5? Being one of the millions Uncharted fans, I couldn’t wait to get my hands on this. But I had my doubts. For me, Uncharted 4 was a masterpiece. One of the best games I have played in my life. Characters, storyline, graphics, music….everything was TOP. NOTCH. The Lost Legacy, while enjoyable at times, does not hold up to it’s predecessor. I should have lowered my expectations. Like. Waaaay. Lower. First of, the visuals are out-stand-ing. Didn’t expect any less in that area. Just look at this (click for bigger). However, the story-line and characters are quite meh. I just couldn’t fall in love with either Chloe or Nadine. Even Nathan’s daughter, Cassie from Uncharted 4 made a bigger impact in that short epilogue than these 2 leading characters combined over the entire game. That says a lot. Another aspect that was disappointing was that 50% of the game took place in a large open world jungle. Open world Uncharted sounds great on paper but not if it’s a huge level that offers little to no variation. I was interested in seeing a bigger variety of levels. R̶u̶n̶n̶i̶n̶g̶ Driving around through the jungle with only a few similar missions here and there made it seem pretty boring and repetitive. But once you get through that level…. 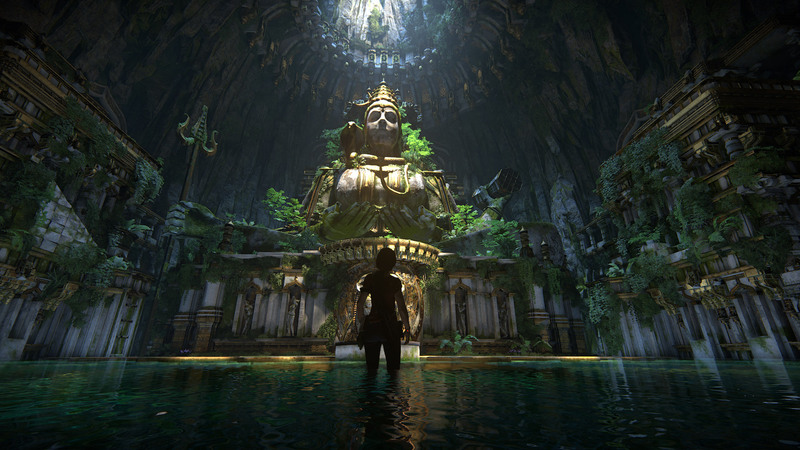 The gameplay is a continuation of Uncharted 4. Jump, climb, climb, climb. Hang. Uh Ohhhh loose edge, fall. GRAB! Phew. Climb Climb Climb Climb Swing Climb Climb Climb Climzz…..ClzzzZzzZzZ. Okay maybe exaggerating but there are a lot of dejavu’s from Uncharted 4. I wish there would’ve been more ways to enjoy the level. More hidden areas. More ways to explore other than climbing and swinging. I actually stumbled on some secret areas in the game BEFORE they became part of the story which felt disappointing. The game starts to become interesting when Sam Drake joins the team. My mood before Sam joins. My mood after Sam joins. Perhaps if he would’ve joined earlier in the game, it would’ve drastically changed my overall opinion of the game. I also have to give props to the persons creating the Uncharted villains. They don’t disappoint. Rafe from Uncharted 4 and Asav from The Lost Legacy are very intriguing and their appearance is great. Look at Rafe’s fashion. They are great villains because at first glance they look like usual people. Just don’t piss them off. – I HATE the shadow puzzle. The other puzzles I had no problem solving on my own but this one made me feel dumb. After 10 seconds of sliding the pieces around I gave up and had to youtube the answer. I’m too dumb for this. – The game needs more chapters. The driving through the jungle chapter is HUGE. If you want to redo that mission alone it will take you half a day. That could’ve been worked out better. – The level “The Last Stand” with all the skeletons was GREAT. I wished it had a bigger part in the story, such a waste of good level design. – Silencer. Nice addition for stealth mode. – The scene with the elephant was great. At some point during the elephants walk I saw something blinking. “A treasure? ?” I kept pressing all the buttons to hop of the elephant. “Stop walking damnit, let me get off”. I assume this was not a treasure. Gorgeous level btw, really loved the atmosphere. I would guess that if you are new to Uncharted and this would be the first title you would play, this game would be much better. Other than that it’s just a fun action title with great visuals.